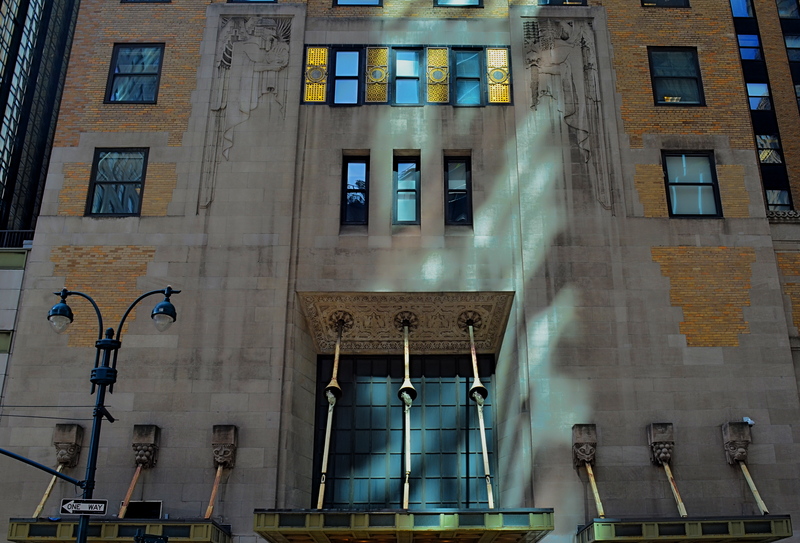 New York is one of the great treasure troves for lovers of Art Deco. This complex, along Lexington Avenue, is literally in the shadow of the Chrysler building. THERE IS, IN THE WORLD OF SPORTS, A PSYCHOLOGICAL EDGE known as the “home field advantage”, wherein a team can turn a superior knowledge of its native turf against its visiting opponent. The accuracy of this belief has never been conclusively proven, but it’s interesting to think on whether it applies to photography as well. Do we, for the purposes of making pictures, know our own local bailiwicks better than visitors ever can? Or is it, as I suspect, the dead opposite? Familiarity may not breed contempt, but, when it comes to our seeing everything in our native surroundings with an artistic eye, it can breed a kind of invisibility, a failing to see something that has long since receded into the back part of our attention, and thus stops registering as something to see anew, or with fresh interpretation. How many buildings on the street we take into the office are still standouts in our mind’s eye? How many objects would we be amazed to learn are actually part of our walk home, and yet “unseen” by us as we mentally drift along that drab journey? It may be that there is actually a decided “out-of-towner” advantage in visiting a place where you have no pre-conceptions or habitual routes, in approaching things and places in cities as totally new, free of prior associations. I’ve often been asked of an image, “where did you take that?” only to inform the questioner that the building in the picture is a half block from their place of business. The above image was taken on Lexington Avenue in Manhattan, not more than a half block and across the street from the Chrysler building. It is a gorgeous treasure of design cues every bit as symbolic of the golden age of Art Deco as its aluminum clad neighbor, and yet I could hold a contest amongst many New Yorkers as to where or what it is and never have to award the prize money. The Chrysler’s very fame eclipses its neighbors, rendering them less visible. Perception is at the heart of every visual art, and the most difficult things to re-imagine are the ones which have ceased to strike us as special. And since everyone lives in a city that is at least partly invisible to them, it stands to reason that an outside eye can make its own “something new” out of everyone else’s “something old”. Realize and celebrate your special power as a photographic outlier. This entry was posted on April 13, 2016 by Michael Perkins. It was filed under Architecture, Art Deco, Cities, New York and was tagged with Architecture, Art Deco, Design, Street Photography.